[JSWSERVER-10854] Sprint suggestions on sprint field provides confusing options - Create and track feature requests for Atlassian products. On Jira 6.1.1 with Jira Agile 6.3.11.0, we have noticed that the suggestions in the drop down show sprints from other boards (which is fine) but do so in a way which is often confusing. 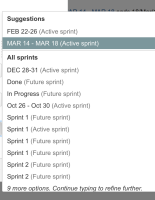 We will often see for example the same sprint name twice, both with Active Sprint in brackets afterwards but no indication of which board the sprint belongs to. Whilst this does not happen for every option (some do show the board) not everyone does.